At the beginning of the season, the track team had plenty of uncertainties, especially on the boys’ side. Though it took time for both teams to get everything together, the girls actually won the first meet of the season in a quad at El Dorado. The season hit a lull toward the middle, but after the meets slowed down to once a week the team began to rebound. The girls went on to place second in two other meets for the season and finish third at league. The boys’ began to peak at the right time, improving steadily throughout the last meets of the season. They placed third in a 12 team contest at Belle Plaine near the beginning of the season and came in fifth at league. The boys actually had a better showing at regionals than the girls’ team, taking 7th while the girls came in 9th. The Rockets were able to qualify four individuals for State and two relays. The boys’ qualified in the 4 x 100 with a time of 44.18 ran by Travis Jones, Cody Wallis, JJ Carney and Dylan Sapp. The relay took 14th in the prelims and were unable to advance to the final round. Carney also qualified in the 400 meter dash. After taking second in the prelims, Carney went on to take third place in the State finals. Sapp qualified in long jump and narrowly placed came in eight with a jump of 20 8.5’’ 1.5 inches ahead of ninth. Janessa McMains won shot put at regionals and went on to take fourth place after throwing 38’ 2’’. The 4 x 800 was the only other girls’ event to make State, ran by Anna Van Driel, Emma Cunningham, Celia Pope, and Emily Witt. The team finished in 12th place and a time of 10:35. The team had a decent season and will look forward to next year knowing the team will only lose two seniors who participated at the State meet. The girls team will take the biggest hit, losing four seniors. Anna Van Driel will be a big loss after she consistently placed or won in the 1600 and 3200 races. The boys’ will only lose varsity runner Braden Carney and should have plenty to build on for the 2018 season. After graduating a core group that had both won regionals and taken second place at State two years in a row, the Rose Hill golf team had to rebuild the program for the 2017 season. 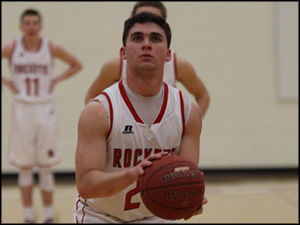 The Rockets only returned four players with varsity experience, led by junior Peyton Austin. He was a strong player from the beginning, winning a few regular season meets as well as league and regionals. 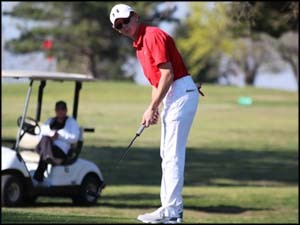 At the State tournament, Austin finished in a three-way tie for first place. The three went into a two-hole championship playoff. Augusta’s Jake Becker birdied on the first hole to secure first place. Austin and Larned’s Massey both shot par to stay tied heading to the second hole. Massey shot par again in the second hole while Austin finished with a bogie and third place. The remaining varsity members, Jonah Robson, Tyler Collins and Broc Heiskell, consistently scored in the high 80s and low 90s, and typically finished in different orders each meet. Freshman Noah Locke was able to go to compete in the last two meets of the regular season as well as regionals and gain valuable varsity experience for next season. 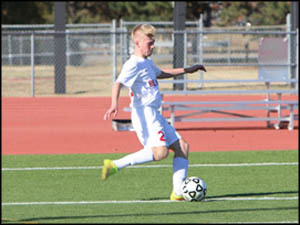 The team will only lose senior Tyler Collins from the varsity team, leaving room for growth and improvement next year. The Rockets will hope to have a strong group next season as Austin prepares for his senior year and the 2018 season. After three-year head coach Sally Smith did not return for the 2017 season, the girls’ swimming team had new leadership under recent college swimmer Tessa Downs. 12 girls came out for the team, which is the second highest total since the program began in 2012. The season started slowly but began to progress quickly. Though the team never blew other schools out of the water they had several strong individual swimmers and relays. Coach Downs stacked numerous events with her swimmers, giving valuable experience and team points. Times steadily improved throughout the season and leaders began to emerge. Sarah Sissel was consistently scoring points throughout the season, finding her place in the 50-yard freestyle. Despite swimming her best time at regionals, Sissel fell just short of qualifying for State. Freshman Tori Kaiser was a strong swimmer from the beginning and also scored individual points throughout the season. Even though the Lady Rockets never won a meet, they always beat out a few teams at every meet. They scored the most points at the El Dorado Invitational with 165 points, but beat out four other teams at the Derby Invitational for their best meet performance. 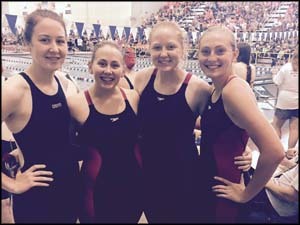 None of the swimmers qualified for State individually, but did qualify in the 200-yard freestyle relay. The relay qualified only after being considered with a time 1.5 seconds short of the required time. After a suspenseful four days, the relay officially qualified. The relay, which consisted of juniors Sissel, Hannah Farber and freshmen Kaiser and Emma Cunningham, took five seconds off their time in the preliminaries to receive and 11th place seed for the finals. The relay swam strong in the finals to take 14th place and finish with their second best time of the season at 1:50. The team will only lose seniors Kelly Bailey and Erin Barlett, leaving plenty of excitement for next year. With a core group of freshman, the girls’ swimming team has a lot of potential to look forward to. Coming off three third place State finishes, the baseball team was looking to travel to State for the fourth consecutive year. The season got off to a bad start, with troublesome at bats led Andale to sweeping the double-header for the start the season. 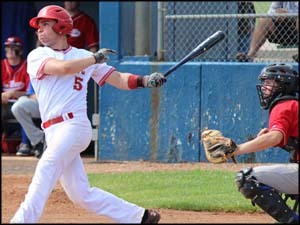 Rose Hill’s first good series came against Clearwater, leading to 7-4 and 18-7 victories over the Indians. Half way through the season and four losses later, the Rockets found their overall record at 3-7. Rose Hill was able to peak at just the right time, winning seven of their next eight games before their last double-header before regionals. The first game did not go well, as Buhler only allowed one hit all night. A 10-0 loss later, the Rockets got back into the series, with lots of help from senior Nate Scantlin. Coming up for his first at bat, Scantlin hit a solo shot to be the first player with a home run at Buhler’s new stadium. He did not stop there, but came back in the third and fifth innings with two run homers in each. Scantlin also relieved the starting pitcher at the start of the fifth and was able to save a 10-6 victory. This game became a pivotal point in the season and guaranteed the Rockets a winning season. A week later, the baseball team was two wins away from their fourth consecutive trip to the State tournament. Traveling to El Dorado, the Rockets took on the Augusta Orioles in a game that went through numerous lead changes and was tied in the seventh inning. After intentionally creating a force out situation with runners at first and second and one out, the Orioles loaded the bases following a hit batter. The next batter reached a full count, but a high pitch walked the winning score home and ended the Rocket’s season at 11-10. The team will graduate four quality starting players, including Griffin McBride, Nate Scantlin, Cayden Gregory, and Hunter Forsberg. The team will hope to keep the winning tradition alive in 2018, even if numerous challenges await. Returning several seniors for the 2017 season, the softball team had their hopes set on reaching the State tournament for the first time since 2014. The season got off to a rough 0-4 start, including a 17-0 loss against Andale. 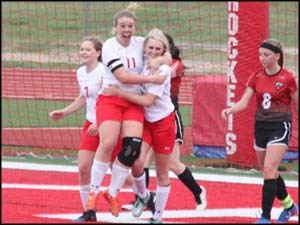 Despite placing goals to improve their offense, the Lady Rockets still struggled getting hits. Things began to slowly come together in a road game against El Dorado, giving Rose Hill their first two wins of the season. 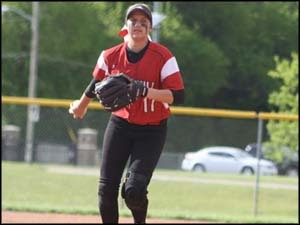 The Lady Rockets went on to a five game win streak before losing a game full of errors. The season seemed to go back and forth, including three more double-header splits in the season. The team was beginning to peak at just the right time. Their offense continued to improve and even outhit their opponents in 11 of their 20 games. Rose Hill still struggled with errors, however, with multiple in each of their last 13 games before regionals. The Lady Rockets met Wellington in the first round of regionals, a team they had split a double-header with just 11 days before. The game started rather quickly in a wild back and forth contest with six different lead changes. Despite the Crusaders seemingly running away with the game after a five run inning in the third, Rose Hill responded with five runs of their own to tie the score for the second time at 9-9. Wellington established a 13-9 lead going into the seventh inning, leaving the Lady Rockets one last chance for a chance at State. 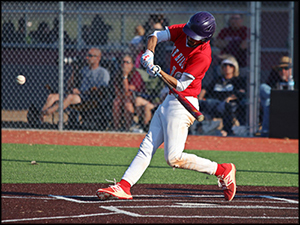 Despite rallying four more runs in the seventh and finishing the game with three more hits than the Crusaders’ 16, Rose Hill’s efforts fell devastatingly close in a 14-13 loss. Both teams made several errors, which proved to be costly in the end. Wellington went on to play Winfield in the championship round for regionals but lost to the Vikings. Even with this heartbreaking end to the season, the Lady Rockets’ 12-9 campaign is the best record since going 13-9 in 2012 and they finished second in the AVCTL. The team will lose four seniors this year but will have a strong group to build around for next year. For the third year in a row, the girls’ soccer team had to transition under the leadership of a new head coach. Coach Henderson’s new system was difficult to get underway at first, with momentum seemingly never on their side. The season got off to a rough start, as 5A powerhouse Newton 10-goaled Roes Hill. Before the Lady Rockets’ first home game, they lost team captain Alyssa Knaak to a season ending ACL tear. Her loss was costly for the team and sucked Rose Hill’s momentum away. As the resulting losing streak continued to grow, the team began to turn things around. Though Rose Hill struggled to put wins together, each game was an improvement from the last. Everything finally came together in the tenth game of the season, when the Lady Rockets shutout El Dorado 3-0 for their first win of the season. That was all the traction the team was able to accumulate as they finished out the regular season. 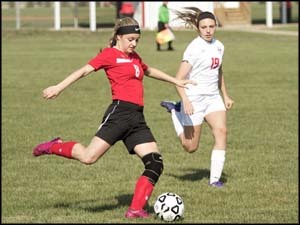 The Lady Rockets played their regional game against rival Mulvane only a week since a regular season game, but lost 3-0 against the 13-3 Wildcats. Rose Hill had to play six teams 5A and above this season, which did not make things any easier. The team will say goodbye to ten seniors after the season, including goalkeeper Rachael Salazar. The team has a strong group of underclassmen and will look to rebound from these learning experiences and regroup for the 2018 season. In just the sixth year of their program, the girls’ swim team is beginning to adjust to new changes. After three-year head coach Sally Smith did not return, Tessa Downs, a previous college swimmer, took over the position. Coach Downs is excited for the season and is extremely grateful for the team welcoming her as the new coach. As a college swimmer last year, she wants to help the team progress as much as possible throughout the season. With several new swimmers, Coach Downs is currently focused on getting the most out of practices and not worrying about winning meets. Instead of placing a high importance on team wins, she wants the girls to focus on improving their own times throughout the season. Coach Downs hopes to teach the team their primary mindset should not be winning, but the lifelong importance of swimming and growing friendships. She appreciates the hard work the swimming team has put in so far, which should help the team improve throughout the season. The biggest change is the emphasis Coach Downs has put on being well rounded in every stroke. For the best results, she has not only told them how to improve, but also shown them how to do each stroke firsthand. Seniors Kelly Bailey and Erin Barlett will lead the team through their experience and maturity after being on the team since their freshman year. Overall, Coach Downs is excited for growth this season and in the next few seasons. With a new head coach for the third year in a row, the girls’ soccer team has struggled to find consistency since 2014. Matt Henderson is taking over the program this year and is excited for the start of the season. The team is learning a new system, which will take time to develop throughout the season. Coach Henderson is thankful for Monte Evans returning as assistant coach and a core group of ten seniors, whom he hopes will help lead the team through the coaching transition. There are also very talented underclassmen stepping in to fill important holes in the lineup. The practices have been tough, but every player has contributed to begin building a solid team. The season has several tough teams on the schedule, including their season opener against Newton on March 17. Despite this initial difficulty, the Lady Rockets are looking forward to the opportunity, hoping to bring positive momentum early in the season. Coach Henderson has various goals for Rose Hill this year, with the first reenergizing the whole program. He also hopes to bring consistency to the program so the team largely consists of underclassmen and avoid rebuilding each year after graduation. Coach Henderson also wants to help players individually, depending on their situation. Predominantly, he wants to teach that any game situation can be overcome through hard work and working as a team. His final goal asks the girls to be accountable on and off the field. Though the upcoming season will have its difficulties, the Lady Rockets are ready to work through the growing pains. Over the past three seasons, the Rockets baseball team has compiled an outstanding 51-22 record for a .698 winning percentage. 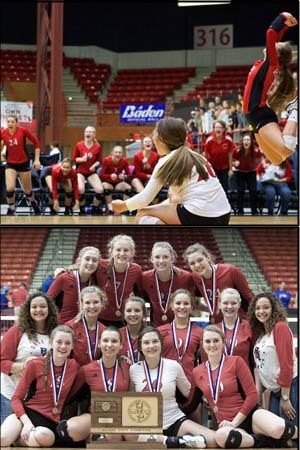 Each of the three seasons ended with the Rockets winning their Regional Tournament and advancing to the State Tournament where they won their first game. However, they have not been able to get past the State Semifinal game and ultimately finished third in the State Tournament. The Rockets graduated ten seniors from that team with most playing varsity all four years of their high school careers. The Rockets do, however, return three starters from those teams that will lead them this season. Griffin McBride, Nate Scantlin, and Cayden Gregory all return for their senior season after being a huge contributor to the success from the past three seasons. In addition, the Rockets will be hoping for big contributions from first baseman Hunter Forsberg as well as newcomers Bradly McAllister and Lane Sadler. Juniors Aaron Moore and Andrew Ibarra will be seeing their first varsity action and could be important players on the team as well. Depth could be an issue for the Rockets depending on how well the younger players step up and perform. If the team stays healthy, they have a chance to once again have a very successful season. However, if injuries plague the Rockets, they will have to rely on younger players without any varsity experience. The Rockets will open their season on March 27th at home against Circle at 4:00 pm. The 2015 season was difficult, but the Rocket Softball team did well in arguably the hardest league in 4A. With only four seniors graduating last year, the Lady Rockets are returning ten varsity players from a season ago. The team is strong as a whole, with several players ready to step up and fill the missing positions. Coach Waltman is looking forward to this season with high expectations. Even in the few weeks of practice, she can see the vast improvements and hard work her team is putting in. The team has a strong work ethic and is very coachable, which are two traits she hopes will allow the team to reach far into the postseason. While the team wants to reach the state tournament for the first time since 2014, there are several goals they will need to complete first. The primary goal for the season will be to build a positive team culture by hard work on the field and as a team. With a solid defense, the first goal is to improve at the plate and make the Rockets a hitting threat. Similarly, Coach Waltman wants her team to be more aggressive at base running and hopefully throw opponents off their game. With great depth in the roster, the Lady Rockets are looking to bring home success. Their first game will be at home against Clearwater, on March 27 at 4:30 pm. Coaching his third season, Coach Barger is looking forward to the upcoming track season. Bringing back half of their state qualifiers from just a year ago, the Rockets are looking to have a successful season. Currently, Coach Barger is working to get everyone in shape and determine which events his athletes want to try. With the majority of state qualifiers coming back, Coach Barger is looking for their leadership. Seniors are Anna Van Driel, Janessa McMains, Sierra Thomas, Kempsie Griffin, and Braden Carney. 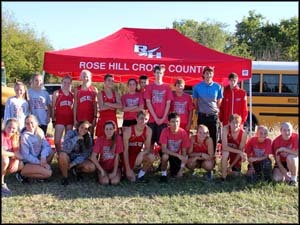 Coach Barger wants his team to be competitive in every meet that will give Rose Hill a good name. 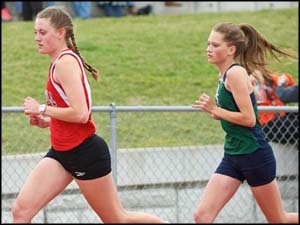 The girls’ team have the ability to win several meets thanks to strong athletes in every event. The boys are in a different position. Though they have the potential for greatness, several pieces still need to come together. With enough work and dedication, Coach Barger is hopeful the Rockets will be able to win League. One of the biggest meets all season is the Pre-State Challenge at WSU, which will tell a lot about the team and season. The early bird meet will be on March 27, at El Dorado at 3:30 pm. The Rocket golf team has started a winning tradition at Rose Hill. Last year’s core group of seniors won 20 out of 30 tournaments during a three-year stretch. The past two seasons have been the best, each ending in a second place State finish. Unfortunately, four seniors graduated last year, leaving the team with only half of a varsity team. The 2017 team will be led by Peyton Austin, a junior from last year’s varsity team with the talent to contend for the individual state title. Senior Tyler Collins and juniors Jonah Robson and Broc Heiskell also have varsity experience and expect to lead this year. The team has one more junior and senior and three freshmen to finish out the team. All scores count for team events, so Coach Siemens will only take four to the first few varsity tournaments with everyone else attending JV events. Coach Siemens hopes the team will qualify for state for the third year in a row with as many individual qualifiers as possible. He also hopes to start the season with a team score under 340 and work from there. The golf team will go to their first meet at Andover on April 3 at 1:00 pm. The girls’ basketball team came into this season with several things to look forward to. Returning 11 letter winners and having several seniors with starting experience all four years of high school was an opportunity Rose Hill did not want to waste. The season started very well, reaching a 10-0 start. During that winning streak, the Lady Rockets won five blowout games, an overtime matchup against Wellington and established themselves as a legitimate 4A contender. Next up was the Haven Invitational, where the team went up against Wellington for the second time that season. The game was back and forth, but the Crusaders won after a half court buzzer beater in double overtime. The rest of the tournament was difficult for Rose Hill with their momentum seemingly gone. After barely winning a 30-29 matchup against Haven in the second round, the Lady Rockets advanced to play Garden Plain, a team they had previously beat earlier in the season. The Rockets struggled against the Owls too and ended up losing 42-48. Rose Hill went back to winning fashion in the following game with a convincing 63-32 win over El Dorado. The team kept up their momentum to close out the regular season with a seven game winning streak. 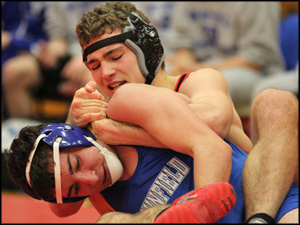 Rose Hill did face Wellington again but kept their winning streak alive with a 49-33 home win. Besides the two-point win against Andale in the season finale, Rose Hill won every game during their winning streak by over ten points. With an 18-2 record, the team earned the top seed for the Sub-State tournament. In the first game, the Lady Rockets faced Mulvane. 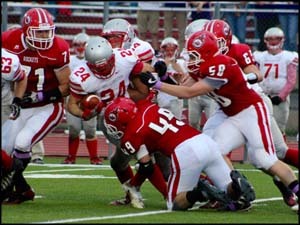 In their two previous matchups, Rose Hill won by over 25 points. The first quarter was low scoring as the Wildcats incorporated a spread stall offense resulting in a lot of time coming off the clock. 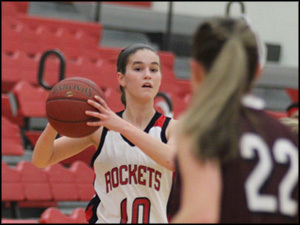 However, the Lady Rockets got going in the second quarter and they cruised to a 48-24 win. Advancing to the final round of the tournament, Rose Hill went up against Wellington for the fourth time. As one of the only teams to beat the Rockets all year, the team knew it would be a difficult game. Both teams battled for the lead, but Wellington took advantage of several turnovers to win 38-35 and continue on to State. Despite the second heartbreaking loss to Wellington, the Lady Rockets have nothing to be ashamed about. They finished their season at a spectacular mark of 19-3 and 10-0 in the AVCTL Division IV, the best season the Lady Rockets have had since 2006. Three seniors led the team in various aspects. Anna Van Driel was the top scorer in nine games and finished the season with 251 points. Mackenzie Herman and Kylie Woods both had over 200 points on the season. Herman led the team in scoring in five games and Woods led in six games. Kanya Simoneau was the leading scorer in three games and finished the season with over 100 points for the fourth highest total on the team. Herman, Woods and Simoneau all have plans to continue their basketball careers in high school and have signed with different colleges. Though all seniors will be missed after their successful high school careers, the Lady Rockets plan to continue their high level of success with several young players having varsity experience. Beginning the third year of his second tenure leading the Rocket’s wrestling program, Coach Eshelman was excited for the 2016-2017 season. Despite the underclassmen outnumbering juniors and seniors two-to-one, the team was coming back with more veteran experience than in previous years. Eshelman brought the team their second best dual record in six years. Despite only recording two wins, if the Rockets did not have three open weight classes in every meet, they could have finished the season 6-2. The team had several strong varsity leaders, but often struggled in tournaments to typically finishing in the middle of the pack. The Rockets best performance was at the Eureka Invitational, when the team finished third out 21 teams. Throughout the season, three Rockets won their tournament weight classes. Chase Thrush and Grant Scheer both won their class twice during the regular season, while Kyle Sackett and David Leck won their class once. Freshman Anayka Besco competed in the first annual girls’ state meet, finishing in first place in her weight class to win the championship. Six wrestlers finished the season with a winning record, and five had over twice as many wins as losses. Two wrestlers also finished the season just one win away from .500. Scheer had the most wins, finishing 31-10 on the season. Thrush had a terrific season as well, going 30-7. These two wrestlers were the first to reach a 30 win season since Jake Wilson went 30-7 in 2014. The Rockets only had two State qualifiers this year after a tough 4A Regional. Three wrestlers, Luke Culbertson, Scheer, and Thrush were only one win away from qualifying. Sophomore Kyle Sackett went undefeated to start the tournament, but lost the first place match to qualify in second place. 145 lb. freshman David Leck won first place at regionals, winning by three decisions and one fall. Sackett had a great start to the State tournament and won his first two rounds by falls. He had a tough third round, losing to McPherson’s Rhett Edmonson by a 2-0 decision. Sackett lost the following two rounds by decisions as well, losing to upperclassmen to finish in sixth place. Sackett was the first Rocket wrestler to place at State since Jake Wilson in 2014. Leck had a tough tournament experience, losing his first two rounds by decisions. Both Leck, 28-14 record, and Sackett, 29-14, nearly finished with a 30 win season, but had wonderful seasons nonetheless. With only two seniors graduating, the Rocket wrestling program should have several seasons to look forward to. Coming off three top four State finishes, the boys’ swimming program started this season ready to impress. After losing over half of the team to graduation, the program was forced into rebuilding this year. Five-year head coach Jared Gaskill also left, with Jeff Schmidt filling the vacant position. Senior Noah Baden and junior Braden Bischler were the only veterans, leaving the team plenty of room for improvement. Four new members joined at the start of the season, including two freshmen. Though these low numbers prevented winning any meets, several individuals and relays brought home top four finishes. The season began to change in the third meet of the season at the Hutchinson Invitational. The 200-yard medley relay placed second, which started improvements that eventually led to the final round of State. The 400-yard freestyle relay placed third, which also helped the relay reach the State-qualifying level. Hutchinson was also the first meet Baden participated in, which improved relay times significantly. 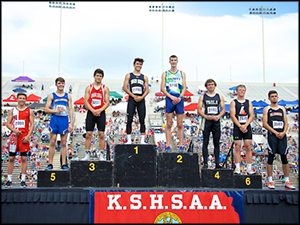 From the start, as a five time State Champion, Baden excelled, placing in the top two during every meet of the regular season. He qualified for State in five individual events and two relays. 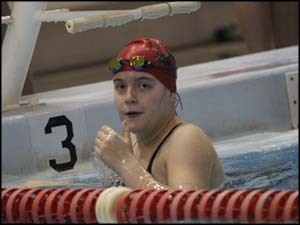 At State, Baden reached the final round in both the 500-yard freestyle and the 100-yard breaststroke. He placed second in both, while setting a new school and career record in the 500 with a time of 4:42. Gabriel Ozanne, a foreign exchange student from Brazil, was a huge asset from the beginning. He came in the top four places nine different times in individual events throughout the regular season. Ozanne qualified for State in both the 200-yard freestyle and 100-yard fly. He advanced to the final round in the 200, finishing in 13th. The 400-yard freestyle did not pass the State preliminaries, but did take off nearly eight seconds from their best time to finish 21st out of 32 other relay teams. The 200-yard medley took over three seconds off of their best time to tie for 15th place in the preliminary round to place 16th in the finals. Hayden Kalp, Baden, Ozanne, and Bischler made up both relay teams. 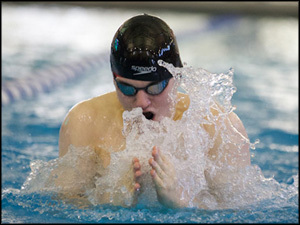 The swimming team placed 19th, with only two AVCTL teams finishing above the Rockets. After a long season, the team was much improved. Kalp and Bischler swam consistent times and freshman Adam Herndon vastly improved from the beginning of the season. Though the Rockets will lose the only swimmers to individually qualify for State, the strong program should be able to rebound next season. In Coach Shirley’s second year as head coach, the team faced several difficulties. Coming off of a State trip one year ago, the Rockets suffered the unfortunate loss of five seniors. Though this season started with decent upperclassmen leadership, it began to dissipate throughout the season with only three seniors staying through the whole season. The season did not get off to a bad start, with the team going into winter break with a 2-4 record. January did not start very well for the Rockets as the team went into a five game losing streak. 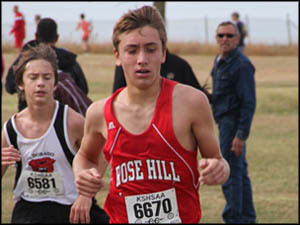 The Halstead Invitational was a highlight for Rose Hill. The first round was against Andale, a team the Rockets lost to by a significant margin in the previous week. In the tournament, the game was much closer, but the Indians still won 46-41. They turned things around in the next two rounds against Moundridge and Garden Plain to finish fifth in the tournament with their first winning streak of the season. At that tournament, all three Rose Hill seniors were given awards. Hunter Forsberg and Griffin McBride both made the All Tournament and All Academic Team while Grant Moore won the three-point contest. The rest of the season continued to present several difficulties after the tournament and Rose Hill was only able to win one other game. Despite the rocky 5-16 finish, the team actually had several close games. Seven games were lost by single digit margins. Three of those games were decided by one-possession, including a one-point overtime loss to Winfield after a buzzer beater shot. Several individuals performed well throughout the season. Forsberg was the leading scorer in 11 games and scored 214 points throughout the season. The next three leading scorers were Moore, McBride, and freshman Koby Campbell. Even with the graduation of their top three scorers, the team will have several players with varsity experience to lead next year. After having several productive seasons, the Rose Hill swimming program is ready to continue its impressive streak. Over the past three years, the team has done well at the State meet, placing 4th in 2014 and 3rd over the past two seasons. Though the program has lost several swimmers, the team has plenty to look forward to. Senior Noah Baden, who placed first in two state events last year, and junior Braden Bishcler are both returning after qualifying for State last season. Jeff Schmidt will take over the coaching position after Jared Gaskill led the program since its beginning in 2011. The team has four new members this year, including Gabriel Ozanne, who is an exchange student from Brazil and has years of competitive experience. Coach Schmidt has high expectations for the team, with a very high possibility of qualifying for state in both the 200 Medley and 200 Freestyle relays. Though it is hard to determine possible state qualifiers this early in the season, Coach Schmidt also expects three or four individual swimmers to qualify this year as well. The team also plans to make several goals before Christmas break after there is better insight into the season’s potential. Overall, morale is high for the start of the season, which will be hosted by Maize on Saturday, December 3, at the Northwest YMCA. The Rocket Wrestling Program has had several setbacks over the past few seasons, but this year, things look to be different. With almost half of the team getting injured last year before facing a stacked regional, the team only qualified one wrestler for the State tournament. Though the team went through a rebuilding stage last year, the team is ready to jump to the next level. Coach Eshelman, who is in his fifth year of coaching Rose Hill wrestling, is excited with the turnout for the upcoming 2016-2017 season. Even though more than half of the team is composed of freshmen and sophomores, the program is returning more veteran experience than in previous years. With this experience, the team is looking to win several duals throughout the season. The team also plans to qualify more individuals for the State tournament. With these goals in mind, Coach Eshelman hopes the team will finish the season ranked in the Top 20 programs within the state. Returning team leaders, who all posted winning records from last season, include junior Chase Thrush, and sophomores Grant Scheer and Kyle Sackett. The first meet of the season will take place at 6:00 on Thursday, December 1, in McPherson. After his first year, Coach Welch has brought a change to the Rocket girls’ basketball program. After a 13-9 season, he was able to bring Rose Hill a winning season for the first time since 2011. Coach Welch believes this success can happen again, but only if the team chooses to work hard with plenty of enthusiasm for the whole year. Though the program boasts 11 returning letter winners, he knows his team needs to take nothing for granted. The team will continue to feature several seniors who have played varsity during every year of their high school career. This much experience rarely happens, which is why such a staggering opportunity cannot be wasted with a complacent attitude. Coach Welch wants his players to earn the right for every win by putting in the necessary dedication and work ethic during practice. For the program as a whole, he simply wants to be the best team they can possibly be. Goals are not being labeled by any record or championship because if the players come together as a unit, everything else will come together by itself. Girls’ basketball will start the season at Augusta, on Thursday, December 2nd, at 6:00. The Rose Hill boys' basketball program looked to change its identity last year, and it worked. Though the season started 0-4, the team was able to turn things around and make it to the 4A State Tournament. In his second year, Coach Shirley’s first goal is to help the players’ character both in basketball and in everyday life. For the season, he wants to become one of the toughest teams in the area, primarily through better defense and rebounding. The hardest will be rebounding, which Rose Hill struggled with last season. Through these goals, Coach Shirley hopes to make other teams not want to play the Rocket basketball team. He also wants to push his players to improve every practice and reach the point of playing at their best level for the Sub-State tournament at the beginning of March. Overall, the program is hoping to continue its progress and take the next step in understanding the game. The team will return players from last year, including seniors Grant Moore and Griffin McBride. Overall, the basketball team has a decent amount of upperclassmen leadership, with six seniors and five juniors on the roster. The team will start the season at 7:30 on Friday, December 2, at Augusta. Rose Hill’s volleyball team has been playing at a high level over the past decade, but for 2016, the Lady Rockets changed pace to reach an exceptional level. For the first time in school history, the volleyball team took home a state championship. After an 8-4 start, the Ladies turned things around with an 11 game win streak. Though they would suffer two back-to-back losses in the Ottawa tournament, Rose Hill never looked back. Since those two losses, the team won 20 games in a row! Out of those 20, only three took a third match to determine the set winner. The Lady Rockets have consistently demolished their opponents by ten points or more. In the state tournament, Rose Hill defeated three-time defending champion Bishop Miege. Though the set was tightly contested, the Ladies won two matches by scores of 25-22 and 25-20 to win it all. The overall season record finished at a staggering 39-6. In her sixth year, Coach Segovia has now brought her team one state championship, five state appearances, and three AVCTL league titles. Though the team will lose four seniors, the team has a lot of depth and experience from underclassmen. Overall, the volleyball team looks ready to continue this impressive play for years to come. 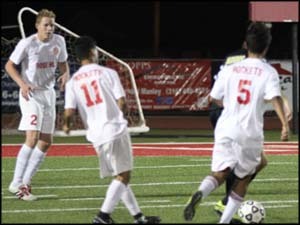 The boys’ soccer team faced a hard season after losing all but one starter from the two-time state championship team, but were able to turn things around for the end of the season. After an 0-3 start to the season, the Rockets began to greatly improve, including 10-goaling El Dorado twice. The season featured many ups and downs, but also featured several win streaks and four shutouts. The second half of the season went better than the first, even though multiple games where played away from home. The season also featured three overtime battles at home, two of which were against Andover Central. The first overtime match, against Buhler, was won by a score of 3-2. The next overtime match, which was the first against Andover Central, ended in a tie with neither team managing many shots on the goal in two overtime periods. 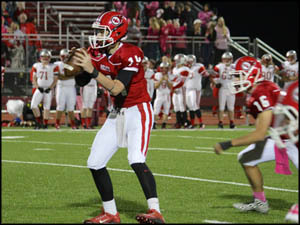 This game proved to be costly, as starting senior Parker Webb suffered a season ending injury. 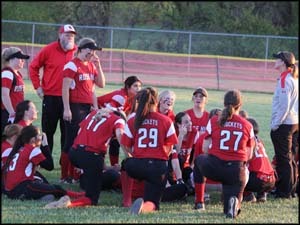 After finishing the regular season with an 8-7-1 record, the Rockets started the 4A regionals against Andover Central. The game was still evenly matched and also went two overtime periods. Unlike the last game, the Jaguars scored in the second overtime to finish the Rocket’s season at 8-8-1. The program will lose eight seniors, who have accumulated a 63-13-4 varsity record over the past four years, as well as two state championships. The team will look forward to next season, where they will hope to reach further into the postseason. Cross country season features many difficulties, and the 2016 season was no different. Everything started off well. The summer runs had the largest participation and balance between rookie and veteran runners for the first time during Coach Barger’s tenure. The team had several senior leaders for the girls, who were Kempsie Griffin, Chasity Carney, Makala James, Brenna Schroeder, Brooke Flowers, and Jessica Nusz. For the boys’ team, seniors were Chase Camarillo, Kelby Dinkel, and Tyler Collins, the only runner who had ran during all four years of high school. The first meet of the season also went well, with Griffin and Collins leading the teams in 4th and 13th place, respectively, in their 5K races. Though she placed 4th, Griffin’s season was only beginning. Throughout the rest of the season, she broke her own 5K record twice, to take first place in the girls’ 5K records with at time of 20:47. For the boys, Tyler Collins led the way, with his best season time of 17:56, only 19 seconds behind his fastest 5K, which he set during the 2015 season. The cross county season was cut short this year with neither the boys nor girls qualifying for state. Though the team will lose so many seniors, there are several young runners who have a promising future. One year after facing an all-time low roster number, the Rose Hill football team is still facing the same problems. The 2016 season was better, but still presented many problems, which was evident in their season opener against Collegiate. After limiting the 4A powerhouse to a seven-point lead in the third quarter, the Spartans capitalized on the Rocket’s exhaustion to put up 27 fourth quarter points. The next week, their record fell to 0-2 as they lost to a very good Mulvane team. The season turned in week three as they pulled out a 7-6 win against Wellington to break an 11 game losing streak, which goes back to last year. From there, Rose Hill kept up the momentum to win a strong defensive battle in Clearwater 16-14 and decimate El Dorado with a 35-14 road victory. The season began to nosedive after the 3-2 start, which was manifested by McPherson scoring 29 points after nursing a 15-8 lead at halftime. District play was during the last three weeks of the season, which started at Andover Central. Rose Hill’s kicker, Parker Webb, was on the sidelines with an ironic soccer injury after playing Andover Central the night before. Forced to go for a two-point conversion, which failed, the Rockets lost the game 7-6. The last two games of the season were both very difficult, with matchups against state powerhouse Maize South and district rival Augusta. Both games featured losses by over twenty points to close out the season with a 3-6 record. The group will lose 11 seniors, including their starting quarterback. The Rockets will look forward to next season, where they will hope to continue improving. After two consecutive state titles, the boys’ soccer team is looking to win it all for the third year in a row. Out of all starters from last year, only Josh Faulconer and Parker Webb remain. Manuel Carasco, a transfer from Derby High School, will also be a starter. While this may seem like a bleak outlook, the Rockets still have other team members to rely on. Seniors Juan De-Luna De-Leon, Aiden Raevsky, and Abraham Luna are likely starters that should help the team compete throughout the season. The team has been working hard over the past few months, including in the Northwest 6v6 High School Soccer Tournament in July. Held at the Stryker Complex, the Rockets proved their capabilities in the final after beating Wichita Northwest 4-3 to win the tournament. Even though Coach Treat and his team will face some difficulties, they are ready to prove they are still a state caliber team. Over the past few years, the Rose Hill volleyball team has established a winning tradition. Though a five-year streak of appearing at State was broken last year, the team was still competitive throughout the difficult schedule, even down to the wire. Coach Segovia plans to continue the winning tradition with hard work. Coach Segovia particularly hopes the team will work together and willingly put in the extra effort within every little part of the game. Due to graduation, the team has several holes that need to be filled. Though this could bring potential problems, Coach Segovia is confident an individual will step up to fill these vacant positions. For the 2016 season, the team will look toward seniors Jaden Heinz, Rachel Salazar, Anna Van Driel, and Brandy Vaughn for guidance and leadership. Even with all the hard work ahead of them, the girls’ volleyball team is ready to push for the prize. After being on the verge of greatness, the cross country team may be able to make the jump this year. Since Rose Hill has been moved down to AVCTL Division 4, both the girls and the boys will have better chances to win league. Not only has the competition changed, but also the team itself. After a low turnout from returning runners last year, the Rockets have more experienced runners returning than in the past years. Since June, overall numbers during summer runs have reached an all-time high. Coach Barger has long desired a balance between veterans and inexperienced runners, which finally appears to be happening. The team will look to varsity runners Tyler Collins and Celia Pope to lead them throughout the season. With this bright destiny on the horizon, the team is ready to put in the hard work necessary. After a summer of hard work, the Rose Hill football team is looking forward to the upcoming season. After a difficult 2015 season, where the varsity team consisted of a large number of sophomores, coaches and players are ready to work hard for the necessary improvements that will result in a successful season. Unlike previous seasons, the team will return its starting quarterback. For this coming season, the Rockets have added a few new players, have started incorporating younger players into varsity roles and even have some veterans returning after one season away from the game. Throughout all of these additions, the coaching staff expects several players will be able to make very important contributions. Coach Boese believes both sides of the ball will keep improving as the defensive and offensive lines continue to progress. Over the summer, the team selected Grant Moore, Tyler Proctor, and Coby Skidis as team captains for the 2016 season. These leaders are held in the highest regard and should help the team develop in character, as well as football, as time goes on. While previous seasons have been difficult, hopes are high this year. Coach Boese believes they can win three out of their first five games. As long as the team continues to work hard and show improvement, the Rockets could have their most successful season in the last few years.